Stated by a Samsung staff, technically, it is possible to make the panel thinner. However, there are some difficulties to reduce the thickness of flexible substrates and circuit component surround it. 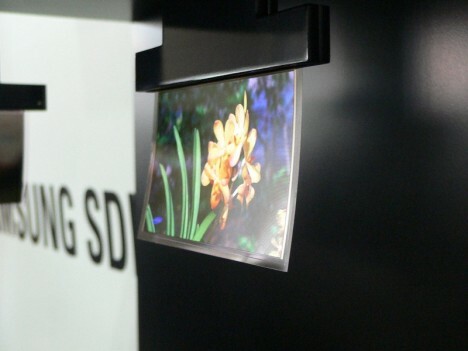 To achieve this thickness, Samsung etched an OLED panel that uses a normal glass substrate. Low-temperature polysilicon TFTs is used to form the drive circuit. Low-molecular-organic electroluminescent (EL) materials were also used. The panel is sealed by membrane sealing technology using a sputtering method, instead of a glass substrate. As a result, the 0.05mm thickness is almost the thickness of the drive circuit board. The display has the pixel count of 480 × 272. The contrast ratio is 100,000:1, and the luminance is 200cd/m2. The color reproduction range is 100% of the NTSC standard.